Black Sandals with a BACK STRAP. So my Rainbow flip flops won’t cut it except for shower shoes. This is actually not a huge deal for me, since I don’t mind putting on my running shoes to walk around the base in my PT clothes when I’m off duty. 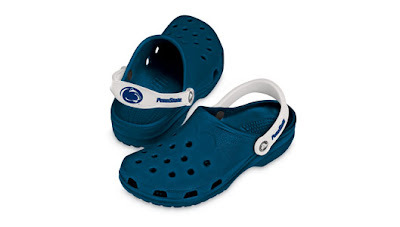 Well, it turns out that recently they started allowing Crocs, and they don’t have to be just black. There are a FEW other colors allowed, such as sand, brown, white (which will turn into sand colored in 2 seconds)…and blue. I have my eye on a blue pair that I might order, since my pink mary janes wouldn’t have cut it. I want to verify the colors and whether the emblems are allowed before I get them, though — just because I’ve seen AF Academy Crocs around doesn’t necessarily mean they’re allowed. Coming soon: stories about Kool Aid Singles and a can of “Pepsi Diet”.